To volunteer you can click here to sign up. Participates may attend the Pizza Swim Party scheduled for Friday, May 3 from 6-9 PM. 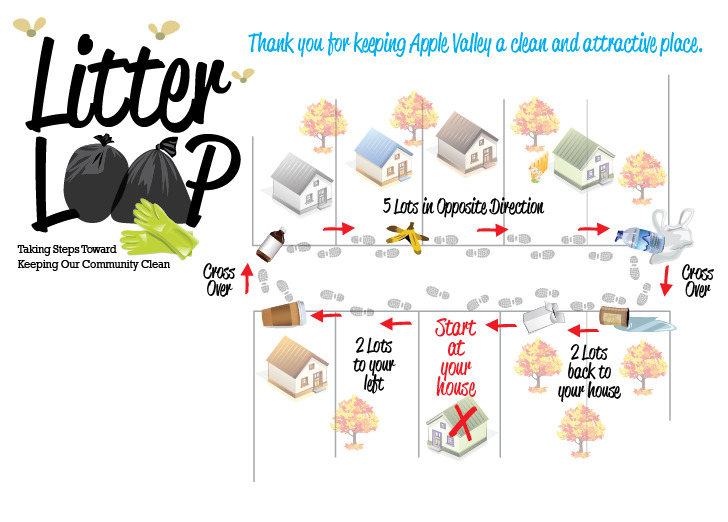 Adopt Your Street encourages "Litter Loop"
We know how much pride you have in our community or should we say our little slice of paradise here at Apple Valley. So let’s put our best face forward and join in the “Adopt Your Street” activity. It is very important to give visitors, our friends and family a good impression of life here in the valley. It also helps keep property values as high as possible. Our Adopt Your Street Cleanup day is great, but roadside trash shows up all year-round. We're encouraging residents to "Do the Litter Loop". It's simple. Not a lot of work. Early every month, grab a plastic bag, some gloves and pick up roadside litter 2 lots to left of your home, cross the street, and bag 5 lots in the opposite direction. Cross back and pick up litter on the 2 lots to your house. That's it! You're done! If you would like to be part of the Adopt Your Street Cleanup Day, please click here to fill out your information (Name, Address, Lot/Subdivision, Phone, and Email), and we will add you to the list of participants. Encourage your neighbors to join you.